Note: There are trails that can take you to Standing-Stones sitting on the tops of distant valleys in places like Wales Scotland, and Ireland. There are Dolmens and Wedge Tombs in secret hedges along river paths, hard to find, on misty rocky plateaus in regions where roads have no names. Eventually pathfinders need to make their way back from the heights to tell the tale of where they’ve been, preferably to some simple comforts, good food, warm fire, and some cheer. 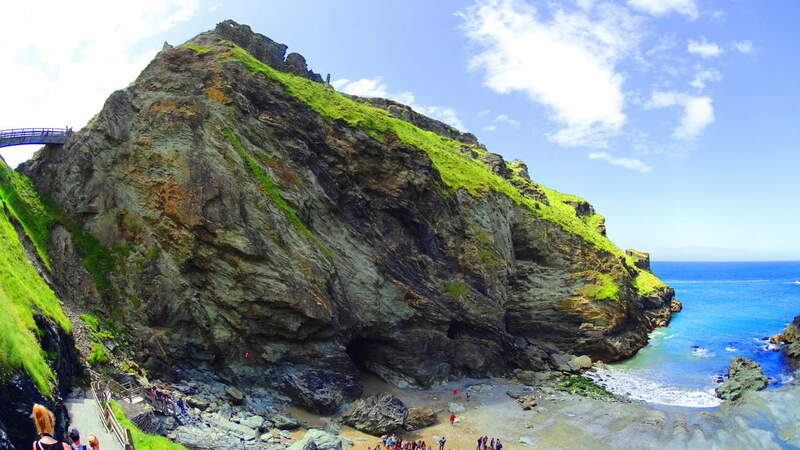 This is Tintagel. 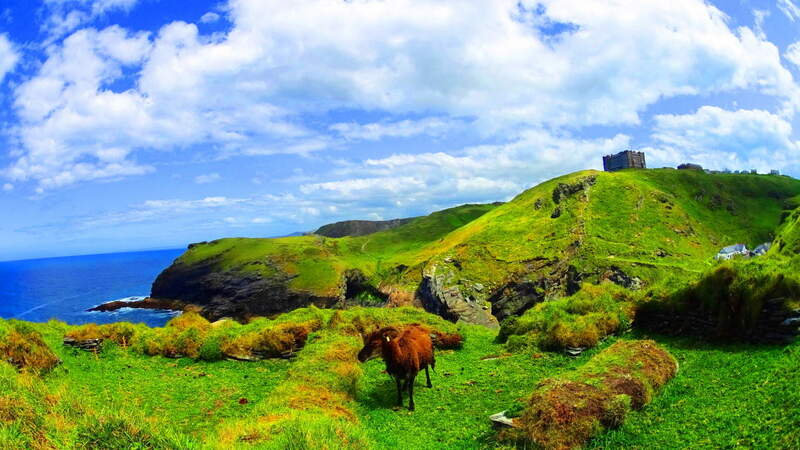 The countryside before reaching Tintagel is timeless, with rolling fields contrasted by the sea, and horses grazing on the heights. 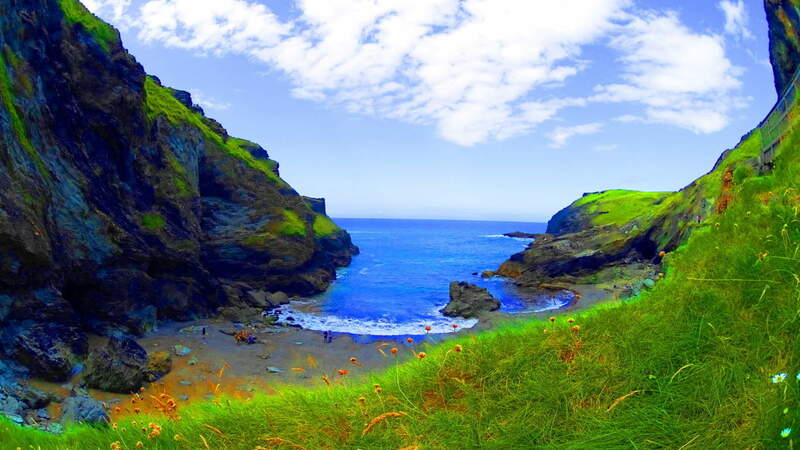 Tintagel is the epitome of the magical safe-haven travelers hope for, complete with an ancient Celtic castle built on a small but lofty island that looms along a 300 ft cliff reaching down to a sandy beach-bay, embraced by rocky cliffs, caves, and waterfalls. Seldom do hiking trails include so many major features in one place. 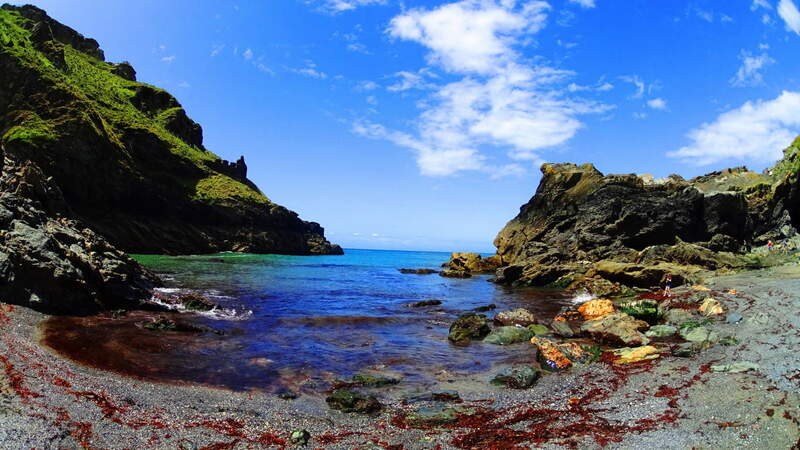 The trail for Tintagel Castle actually begins a mile before reaching the coastal scene, back in the center of the medieval town of Tintagel, which is now a beautiful bustling modern hamlet with every manor of comfort to offer. The trail literally begins from the main road in the center of town, extending down to a flowing freshwater stream with a path that leads straight to the Castle/Bay. 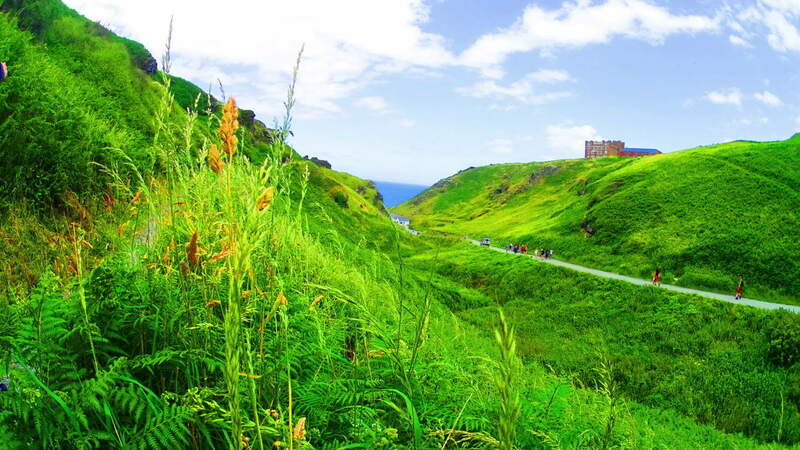 Pass through a hilly cascade of tall grass and stony ledges that leads down to the coastal scene and gate. There is a small fee to pass the modern gate, where you are then free to make a choice of walking the elevated wood-board trail that leads over a high bridge onto the island, on which the ruins of Tintagel Castle sits, or down a winding sandy loop to the beautiful beach, megaliths, and massive rock caverns. A portion of the main gate of the castle still stands today. This is is the original Celtic entrance-way to the paths leading to the inner grounds, and around the Island. 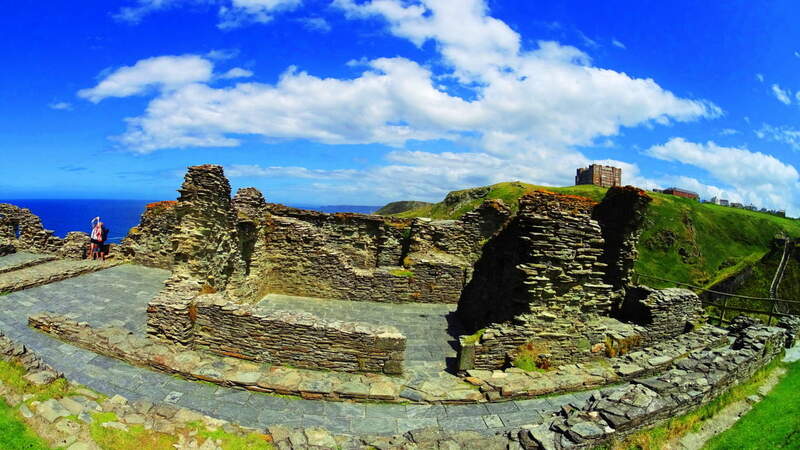 This rare archaeological site contains priceless remains of a Celtic Castle, one of the earliest Christian monastery’s in history, and Medieval period stonework. Almost every Celtic myth has origins here, including perhaps the most epic of all, The Arthur Legend. 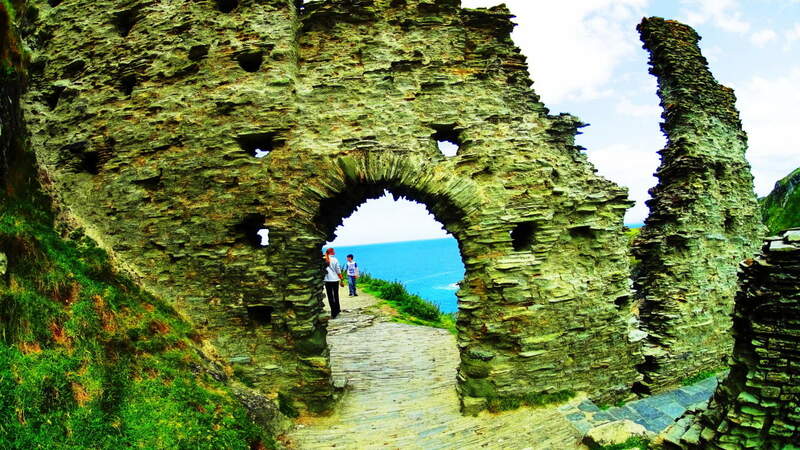 The story goes that Sir Gorlois, the Duke of ancient Cornwall, locked his wife Igrain in Tintagel while away battling for the Kingship of all England. Sir Uther Pendragon then disguised himself to look like the Duke by the magic of the legendary Druid Merlin, who lived below in the caves. Uther crossed the deep chasm of the bay on a magical mist created by Merlin. and entered the castle to conceive a child with Igrain. The child born of this intense mystical situation would be the legendary King Arthur. The myth of Sir Gawain and The Green Knight also began here. It is from this castle that Gawain sets off to find the ethereal crystal castle of the Green Knight, somewhere to the north, perhaps in Wales. In recent years archaeologists unearthed a piece of Cornish slate with a version of the name ‘Arthur’ written on it, as well as items from France, Spain, and Ireland, indicating that this was an extremely busy and successful international seaport. These upper paths run for about a mile-and-a-half around the south-east edge of the island, with wild goats grazing, and gorgeous views of the blue-green Irish Sea. Once you’ve made your way around the Castle island, work your way down one of the most picturesque bays in England. With the Castle ruins looming over the entire scene, it is easy to see why the ancients chose this place to live. Freshwater streams roll down to the beach. 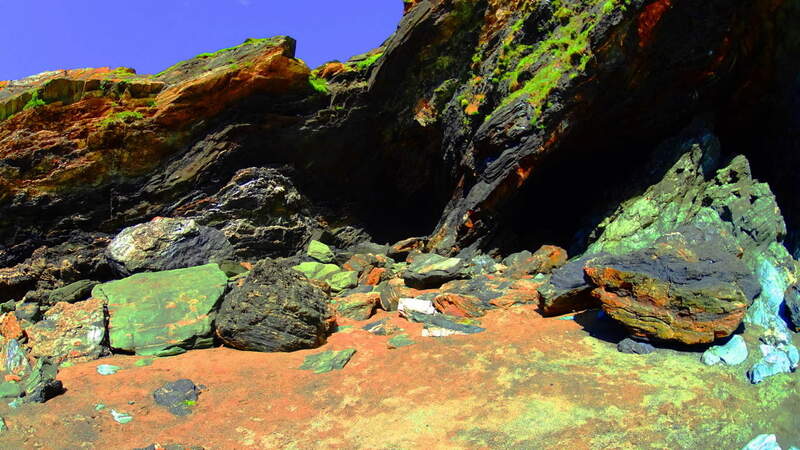 Massive free-sitting boulders guard the cave entrances, along with mysterious standing-stones interlocked along the beach and rocks (top images). 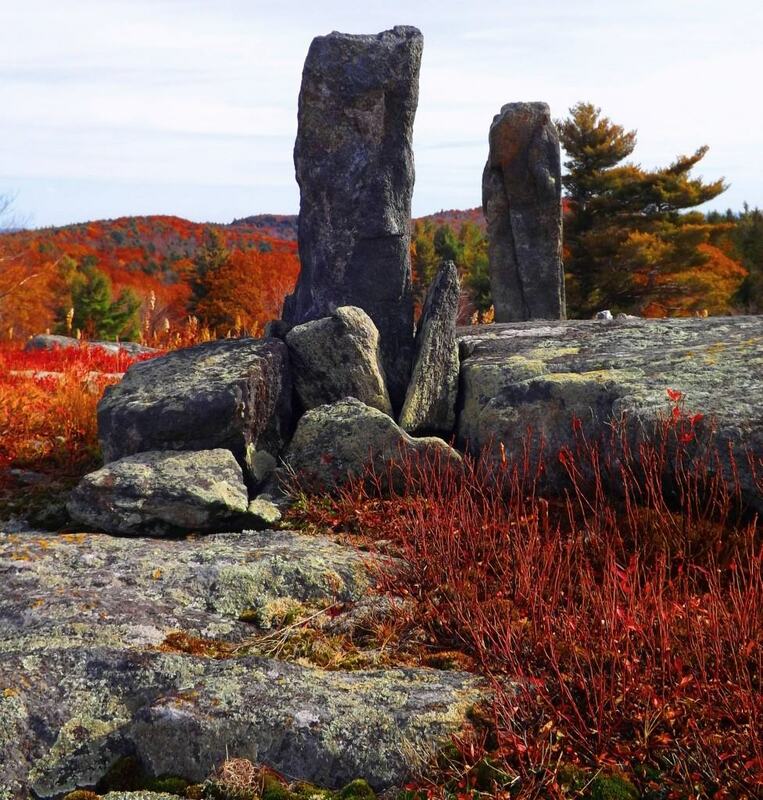 This interlocking style is very similar to the standing stones at the sacred alter in Heath Massachusetts, across the Atlantic. The boulders are sitting above other rock faces (pictured below), and centrally to the entire scene, as if they were placed. This is, again, very similar to boulders at other megalithic sites. 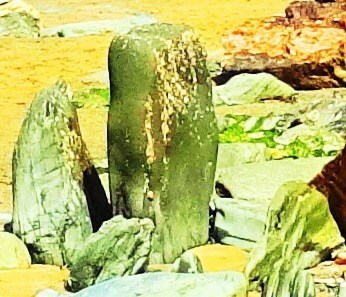 These are specifically placed stones that date back to pre-Celtic times, associated with giants, when England was known as Albion, meaning, “Land of Giants.” This beach is filled with white sand and mesmerizing tidal flow from the Celtic Sea, which paces everything like a hypnotic dream. You may very well find people reciting poetry about the birth of King Arthur on the beach, or getting some sun. This is a place to take your time and revel in the history and scenery. 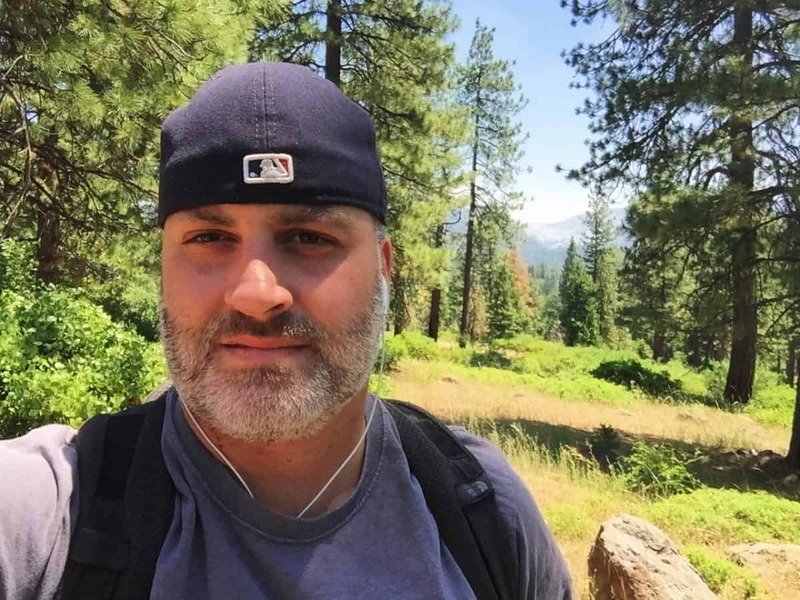 The entire excursion is about 4.5 miles worth of hiking, after making your way back to town. The energy at Tintagel is palpable. Here you don’t just get an epic glimpse of how things once were in simpler times before the modern world had its way, you feel it.